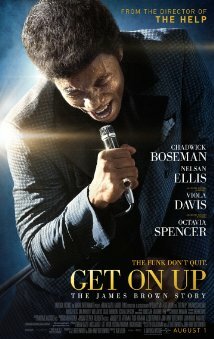 “I paid the cost to be the boss.” By the time we hear these words in the new James Brown biopic Get on Up, we know they’re true. Chadwick Boseman (42), who plays James Brown in the film, speaks this revealing lyric directly to the audience in one of the film’s signature fourth-wall breaking scenes. Appropriately, Get on Up is not a traditional musical biopic. Director Tate Taylor (The Help) keeps things interesting by including Boseman’s asides to the audience as well as shaking things up with a fractured and non-linear storyline. These choices along with some excellent music make Get on Up a movie worthy of its subject. Get on Up opens in 1988 with a disheveled James Brown entering an insurance seminar with a shotgun and telling everyone to leave. Not what you were expecting? That’s the point. The film then flashes back to Brown’s childhood and remains mostly in Brown’s past bouncing between his youth, teenage years, and young adulthood. Brown’s childhood is awful. At a young age, his mother (Viola Davis) leaves, and he is forced to live with his abusive and violent father (Lennie James) in a small shack outside Atlanta. When his father joins the army, young James is left with his Aunt Honey (Octavia Spencer), a madam of a brothel in Augusta, Ga. Recipe for disaster? You bet. James is soon arrested for petty theft but with no official home address, his sentence is extended. When a gospel group lead by a young Bobby Byrd (Nelsan Ellis) comes to entertain the inmates, James finds his “soul” mate. With Byrd’s help, he is able to get out of jail and together they form the historic Famous Flames. And so it is in prison of all places where James Brown finds the funk. What is funk? Well take Get on Up, subtract Clint Eastwood’s tepid Jersey Boys, and what you’re left with is solid gold, toe-tapping funk! And what we have here is a funk filled film. In the theater where I saw this film, two women were dancing in the aisles during one of the scenes. That speaks volumes to the power of James Brown’s music and the way that Tate Taylor utilized it. But an equal amount of credit must go to Boseman for his performance. He expresses the complexity of James Brown with every dramatic scene and he embodies the physicality of Brown in every performance scene. This is a performance on par with Jamie Foxx’s portrayal of Ray Charles in Ray, although Boseman does lip-sync to Brown rather than sing. Still, you can’t dance-sync and Boseman is electric on his feet! Get on Up is rated PG-13 and has a running time of 2 hours and 18 minutes.